Cranberry-Pecan Quick Biscuits make the perfect pairing for the soup course. They are super quick to make, prepping for the oven in about 5 minutes. Put the flour, baking powder, baking soda and cinnamon in a large bowl and stir with a dry whisk to combine. Stir in the cranberries and pecans. Stir in the nondairy milk and maple syrup. Mix just until incorporated. The batter will be quite thick. Don’t overmix or the biscuits will be tough. (If the batter seems a bit dry, add one more tablespoon of nondairy milk. If the batter seems too wet, add one more tablespoon of flour). 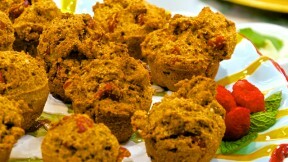 Divide the mixture among the prepared muffin cups. Bake for 20 to 25 minutes, or until golden and a toothpick inserted in the center of a biscuit comes out clean. Put the muffin tin on a wire rack and loosen the sides of each biscuit with a knife. Cool for about 5 minutes. Carefully remove the biscuits. Cool 10 minutes more. Serve warm or at room temperature.